No matter what the outdoor task is, this kit outlasts most of your gear! The canteen is made of aluminum. 1 x Canteen. 1 x Canteen Cup. Consist of bottle and cup, convenient for outdoor sports such as camping. 32 ounce Nalgene style water bottle, with national guard logo on one side and medical corps logo on the other. ACU pattern camouflage. Never opened, still in bag. Coleman WATER BOTTLE HOLDER SLEEVE. Insulated Bag. — NEOPRENE —. zippered pocket on front. black gray and green. Network Tools and Supplies. Vacuum Sealed Wide-Mouth Stainless Steel Water Bottle. Vacuum-sealed air gap. Food-grade 18/8 stainless steel. read more. Smart Box Systems © 2017. (Not Selected). Computers/Tablets & Networking. Condition is New. Silicone bottom & handle with silicone gasket in cap. Can use with cold or warm water. I refer to this nice canteen as a Prospector's Canteen. The outer ruffled tin band is to hold the wool in place and to provide the 4 strap brackets for the linen or cotton carrying strap. This one is in nice condition, Charlie Harris. 1Paracord handle of choice for wide mouth flask or similar. Will fit wide mouth flasks. As well as narrow and standard flask thru hole on the cap or around the neck. 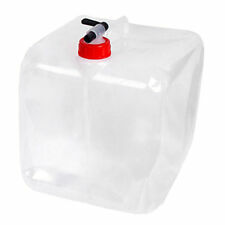 Will also fit regular Water bottles, and many other sports drink bottles that have a lip on the bottle. It's a tear drop shape and has a screw on lid. There is a red braided cord on it for carrying as well. Very unique piece, I could not find another quite like it. Try the "ZOOM" feature, it is a great way to take a closer look. Regretfully, I. All other locations will cost more. Obviously Well Used. Has Stains & Wear.Still Works. Width 3", Height 12 ". Looks to be in very good condition. Free S/H In the USA. Round fabric canteen aluminum with should strap. “The Tassle Was Worth The Hassle” Water Bottle. Condition is New. Never Used. Perfect Gift for Recent Grads! This water bottle is in excellent unused condition. Can hold 2 Liters of Wine. Water Bladder Features Fits All TRU-GEAR / 5ive Star Hydration Products. 2.5 Liter Capacity. Butterflies and Paisley. vacuum insulated. and easy to grip powder coating. Made from food grade stainless steel. will keep your liquids at the perfect temperature for hours. Whether it’s hot or cold, 20 oz. Very good condition 1 liter leather canteen. Has a small stain on the bottom of one side. Leather & Vinyl Bota Bag. For your Consideration isONE. New Hydrapak Stash Collapsible Bottle Smoke Gray Color 1 Liter 32 Fl Oz C3. Condition is New. Shipped with USPS First Class Package. MERRELL water bottle. Condition is New. Shipped with USPS First Class Package. It will fit a Nalgene, but not sure if it is a Nalgene Cap. I believe it is for the wide mouth type bottles. Happy Water Drinking! We are open 24-7! 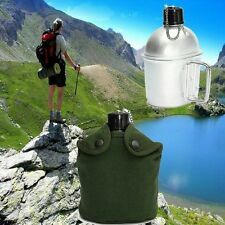 Camouflage covered Stainless Steel Flask 8oz Outdoors. This Flask is used in good condition. Being sold as is no box or literature. Thanks for looking. Check out our other listings. All listings paid for after 12pm Eastern Standard Time shall be shipped the next business day. Thanks. Vintage Suede Leather Water Canteen Made in Spain! Great Condition! There is also a larger bag that holds more water in that bag is older than the Grand Canyon ones. These bags are in great condition. They have not been used. Canteen Wool Covered Blanket Oasis Adjustable Strap 7.5 x 9.5 Vintage. This is an unmarked canteen. Rust here and there on it. But I can't date it. Has wear on the wool blanket. I think it was made that way. The strap is adjustable. Very light spot on the strap that is adjustable. This one has the red strip to the top of the canteen. This is an unmarked canteen. Has rust on the top and in various placed. I can't date this although I do believe it's older. Has wear on the wool blanket. Promotional LEADER DOGS Stainless Steel Water Jug. NEW IN BOX. 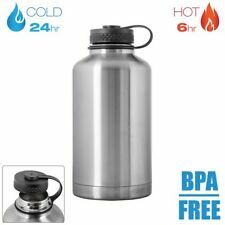 25 oz Aluminum Water Bottle Flask BPA Free . Condition is New. Shipped with USPS First Class Package. Network Tools and Supplies. Vacuum Sealed Wide-Mouth Stainless Steel Insulated Water Bottle. This water bottle features double-wall vacuum insulated stainless steel design. Vacuum-sealed air gap. Food-grade 18/8 stainless steel. The blue carabiner is attached to the larger lid Good, working condition - one more worn than the others - still working! Brand New! Chan Zuckerberg Initiative Aluminum Bottle! This is a white aluminum bottle by the Priscilla Chan & Mark Zuckerberg of Facebook. It features a “CZ” for Chan Zuckerberg! This bottle is to support the Chan Zuckerberg Initiative. The bottle is 24oz or 710ml & is single wall aluminum with a Keyring & Carabiner & threaded twist on top. The Chan Zuckerberg Initiative is an initiative started by Priscilla Chan & Mark Zuckerberg of Facebook. It’s message is one of inclusion & equity. Their mission is better the lives of those in need, a very worthy initiative. It’s worth reading up on & supporting. This bottle is from the Chan Zuckerberg initiative. Type: Pill Water Bottle. Features: 2 in 1, Portable, Pills Holder, Water Bottle, Convenient. Capacity: 20 ounce. Vacuum Insulated Stainless Steel Hot/Cold Beverage Bottle 17 oz Featuring Royal Canadian Mounted Police. THE KING OF THE MONARCHS. OLD DOMINION UNIVERSITY. 28 oz plastic water bottle with gray, screw cap (attached). BIG BLUE (a lion) as. Plastic is opaque and royal blue with white printed logo from. This is for a canteen with striped felt and metal edging. The metal is aged and has rust from being in storage so long. This canteen has a plastic lining and is in great condition. This also has an adjustable shoulder strap. The cap is plastic and is a screw on style. This is a very usable item or could be used as a decor item. The diameter of the csnteen is 7 inches. RAWHIDE LEATHER. 4 QT Quart. BEIGE BLACK. You will want to put this through your own preferred sanitation process to make this drinkable. AMAZING CONDITION! Featuring a rugged, stylish leather exterior, the Bota bag has a heavy-duty interior lining that protects bag and taste of your beverage. The traditional Spanish liquid receptacle [wine skin]. Rugged suede leather exterior ~Braided red shoulder strap. I think it holds 2 Quarts of water. A great water bottle to carry along on a hike, bike ride or just a walk.